Despite Saturday’s relentless rain, a crowd of supporters showed up to Democratic Del. Jennifer Boysko’s campaign office in Sterling that morning to help her knock on doors and get the word out about the Jan. 8 special election. Boysko, who has represented the 86th District in the House of Delegates since 2016, is vying for the 33rd State Senate seat, vacated by Congresswoman-elect Jennifer Wexton. She faces Republican Joe T. May, founder and owner of electronics manufacturer EIT in Leesburg who served in the House of Delegates from 1994-2014. 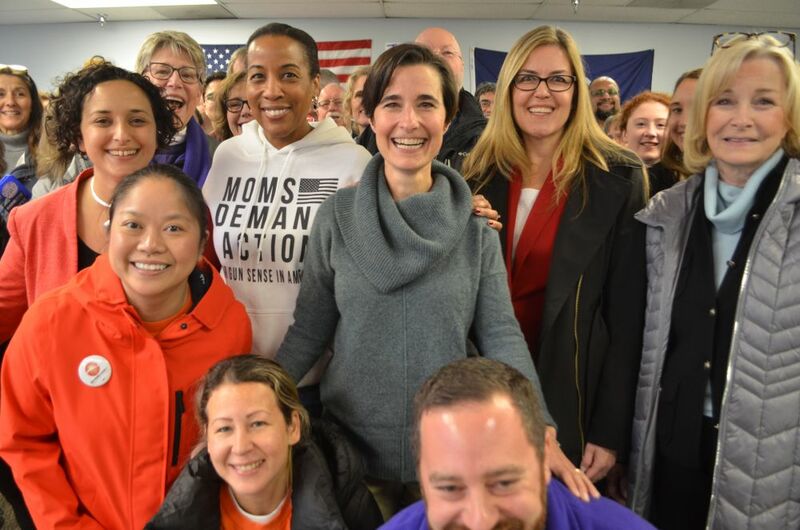 Boysko’s canvassing event Saturday doubled as the official kick off for her state Senate campaign. The 52-year-old shared about how she’s wanted to help others from an early age when she saw firsthand how her mother struggled to make ends meet. Her mother dropped out of college to marry her father at 18. The marriage did not work out, and she was suddenly a single mother who had never before held a job. She found a minimum-wage job without any sick leave, “so if I was sick she’d have to decide if she was going to pay a babysitter more than she made for the day, or leave me at home by herself,” Boysko said. Boysko has also been endorsed by Gov. Ralph Northam, Attorney General Mark Herring, all six members of the House of Delegates whose districts overlap with the 33rd Senate District, and local officials including Loudoun County Supervisor Kristen C. Umstattd (D-Leesburg), Leesburg Mayor Kelly Burk, and Loudoun County Chairwoman Phyllis J. Randall (D-At Large), who also spoke at Saturday’s campaign kick off. Learn more about May at joemayforvirginia.com and about Boysko at jenniferboysko.com. Del. Jennifer Boysko supporters surround her for a photo at her campaign kick off. Her supporters include, from left, Loudoun County Chairwoman Phyllis Randall, Congresswoman-elect Jennifer Wexton, and Del. Kathleen Murphy. She’s endorsed by all of the democrats. Shocking. “… and there is no one I would be more honored to take my seat than Boysko.” Said Wexton. Ever notice how the political class always view our seats as their own personal property? It wasn’t ‘your’ seat Wexton. It belongs to the voters — you’re nothing more than an employee, despite the self-aggrandizing mush you tell yourselves. You are too polite; we are just their slaves and servants even though they are supposed to be public servants. Oh gosh she cares more than other people! No, she is just spending more of other people’s money! How about helping the working people in Loudoun by lowering our taxes and fees and reducing politicians benefits and perks that exceed those of us deplorables. Mark Herring is on board. Wow, so wonderful! He wants to stop the hate … of everybody who is not a republican. Dims just want to help all the illegals, felons and LTBQs. Deplorables and those who can pay more taxes are the suckees. No wonder they are all smiling as the dims destroy a good man like general Flynn. Boyo talks about how magical money is paying more for medical care. Good luck if you think the government is going to take care of you. All they want is your vote. Once they have that they will give you the absolute least amount of care to someone else and then ask for more of your money and blame those cheap skate republicans for any problems. We won’t mention how the left wouldn’t apply obamacare to itself, how they have better healthcare and benefits than any person in the real economy. You know it is real easy to spend other people’s money but dems care so much more. It is an old and familiar tune: tax and spend. Watch out they are coming for your wallet and your family’s income but its disguised as charity. The charity is only for them. Yeah!!!! We Pu**y Hats are taking over the senate!!!!!! 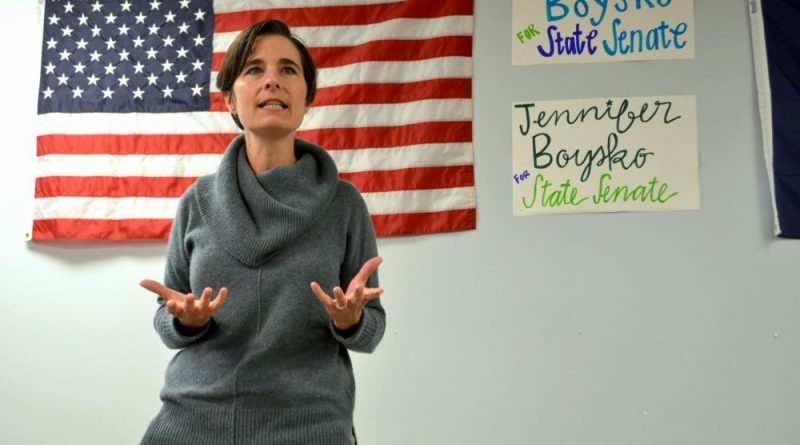 Jennifer Boysko has been fighting for the kinds of things we all care about like free tampons. Bras should be free to. Please vote!!!! Now the leader of her party wants a 2.1 billion dollar increase in state spending, see the tax cuts shrivel. Expansion, yes she did, but she miscalculated the cost by 460 million dollars or 54 dollars a year for every man, woman and child in Virginia. This is a never ending tax that your grandchildren and their kids will be paying. Mistakes are made but a 460 million dollar reoccurring bait and switch might be okay with the wide left but not with people who have to pay their own bills. Vote Joe May on the 8th. 460 million dollar mistakes by candidates does not win elections. Not real good optics when you have to bring in out of state union workers to canvass in a right to work state.